With a high-quality build and plenty of customization on deck, the Vanguard VEO 265AB is one of the best travel tripods out there. The Vanguard VEO 265AB is the little brother to the full-sized, pro version of the 263AB. It has a lot of the same design touches, control features, and material choices. Since it’s a travel tripod, it prioritizes weight and portability more than sturdiness and build quality. As such, it might not be the best choice for your main studio tripod, even though it is surprisingly durable and substantial for its size. 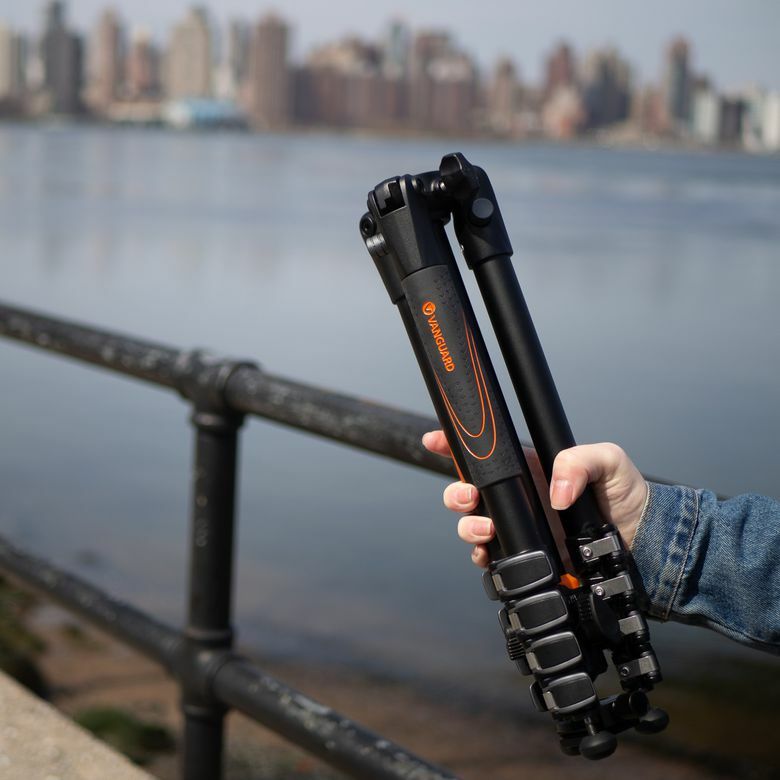 We used it on some shoots around our home city of New York, and found it to be among the best travel tripods we’ve tested. In line with the rest of Vanguard’s product lineup (which includes things like hunting supplies, binoculars, and hiking gear), the Vanguard VEO tripods lean very sporty. They’re mostly built of black aluminum with a few nice silver touches, and some eye-catching orange accents. There’s actually more orange on the tripod than there is on some of the larger ones, which is probably intentional—a more active color scheme fits the on-the-go use-case this travel tripod is mostly aimed at. Because Vanguard builds all of their products with the same style, the 265AB does look like a shrunken version of the larger ones. You’ll notice some smaller components like the 1.5-inch barrel holding the rotating ball head, and legs that are roughly only an inch thick. It’s a slim, sleek look that serves its purpose well. When we first took the 265AB out of the box, some joints and mechanisms were very stiff, particularly the telescoping legs. Even after we’d loosened the knobs or undone the clasps all the way, it felt like we had to use an undue amount of force to get the tripod opened and expanded. This amount of resistance was surprising. While it could indicate that the tripod is sturdy and reliable, it does leave a bit of concern about the manufacturing process. Once you figure out some of the quirkier mechanisms, this is quite possibly the best choice for your go-to travel tripod. Each leg contains four separate telescoping sections, which is double what you’ll find on most non-travel tripods. It’s also one more level of height customization than you’ll find on some other popular travel tripods from competitor brands. This was a really nice addition, and we found it easy to line up the perfect height. The legs also fold out and lock to three different angles, which is pretty common for tripods, but we found the spring-loaded push-button locks to be a bit finicky. Once we overcame this learning curve, it was pretty easy to get the right angles locked in. Finally, the camera mount section was also a bit of a mixed bag. The full 360-degree horizontal barrel moves very smoothly, which will offer nice fluidity for video panning, but the ball mount was definitely cheaper compared to some larger models. If you’re hoping for the smoothest ball head this isn’t it. Otherwise, everything from the Arca Swiss-style QS-60S quick-release mounting plate (for rapid camera attachment) all the way down to the rubber feet with poke-through spike option (for greater stability outdoors) worked really well for our shoots. In the travel tripod category, one of the paramount parameters is obviously going to be portability, and we’re happy to say that the Vanguard VEO impressed us across the board on this front. At 3.7 pounds it’s among the lightest travel tripods we tested, and the weight distribution makes it feel really balanced in the hand when folded up. Speaking of which, the folded-up size is an impressive 15.4 inches, meaning it will fit nicely in the tripod mount (or even the water bottle holder) on most tech or carry-on bags. Again, this is where the weight distribution comes in handy, because it didn’t wobble back and forth on our bag. We’re guessing this is aided by the interesting 4-latch design on the telescoping legs, and it was really nice to see on a tripod billed so heavily toward travel. At 3.7 pounds it’s among the lightest travel tripods we tested, and the weight distribution makes it feel really balanced in the hand when folded up. The durability of the Vanguard VEO is what impressed us the most. Because it’s such a compact size, the thick aluminum legs and the substantial metal mounting components feel all the more sturdy. It is the heaviest option in Vanguard’s VEO line, and this works to its advantage, as Vanguard claims the tripod can support over 17 pounds. The tripod will accommodate any DSLR, even ones with a hefty grip and a huge lens in some cases. As mentioned above, the telescoping legs feel very tight, and the jury is out on whether this means they’ll last longer, or whether it’s a slight manufacturing oversight, but this fact did provide us some confidence that there’d be no slipping once the camera was set up. Alongside portability, the durability of the Vanguard VEO was probably what impressed us the most. The Vanguard VEO follows suit with the rest of the Vanguard line and provides you with only the bare minimum for accessories. The bag feels great and substantial, though the strap leaves something to be desired. The Swiss quick-release plate is one of the better ones we tested, though we’d consider this part of the tripod itself, not necessarily an accessory. There’s also an included Allen wrench for fine-tuning some parts of the unit. And that’s really about it. Take a look at our selection of the best camera accessories. The price is another one of our favorite aspects of the Vanguard VEO travel tripod. While many of the other options for more premium brands come in much closer to $200, the Vanguard can range from $99 to $179 depending on where you buy it. The sub-$100 price point is mind-blowing when you consider the build quality and portability on the 265AB. In fact, for that price, you might want to pick this up as your main studio tripod, not just your travel tripod. You’ll miss out on a little bit of weight capacity, but really not much. Take a peek at some of the best camcorder tripods you can buy. Manfrotto Befree: Best we can tell, the real reason you’d go for the Manfrotto over the Vanguard is on brand alone. Sure there are some nice design and functionality touches, but for our money, the Vanguard is a better value. Vanguard VEO 204AB: If you want more portability and an even lighter construction, at 2.8 pounds, the 204AB is about as light as you get, though you’ll sacrifice some load capacity. Mefoto Roadtrip Tripod: We didn’t test this one in-hand, but the price looks pretty good, and the functionality seems passable. However, all signs point to a slightly cheaper build quality than you’d get with the Vanguard VEO line. One of the best tripods for the price. ﻿﻿The Vanguard VEO 265AB really is one of the best tripods we’ve tested, dollar for dollar. The portability is virtually unmatched (outside of the smaller options from the same VEO line), and the build quality is surprisingly substantial despite that small size. Once you figure out some of the quirkier mechanisms, this is quite possibly the best choice for your go-to travel tripod. Product Dimensions 15.3 x 4.5 x 4.5 in.